One Friday last school holiday, the kiddo stayed the whole day playing with the daughter of our close friends. They are a lovely Korean couple and Antonio adores Aerang (the mom) so much. We always try to catch up on a regular basis; usually dinner at our place or theirs. That Friday afternoon when I picked him up, I was also invited for dinner. But what was so exciting was that I was in for a treat! Free homestyle Korean cooking lessons! Up close and personal. Yey! 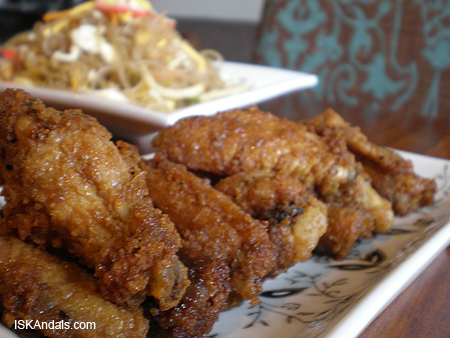 We had stir-fried cellophane noodles and fried chicken wings. I was ecstatic. 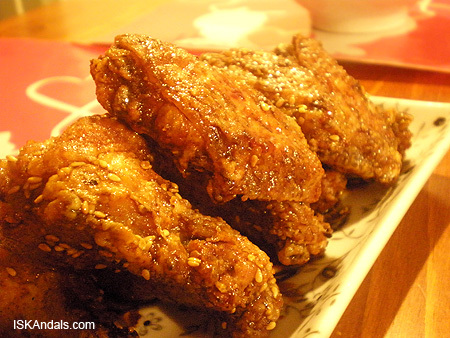 I have always loved sweet and spicy Korean-style fried chicken. Aerang said Korean soy sauce is the key and so I was always trying to find one whenever I am at an Asian dairy. Challenging, as I couldn’t find it with all the Korean characters. So I turn Japanese. There are few versions, sometimes with corn syrup and sesame seeds. A dash of chili flakes or chopped red chili gives extra zing. Sometimes ketchup instead of soy sauce to give it a reddish color. You can always improvise. 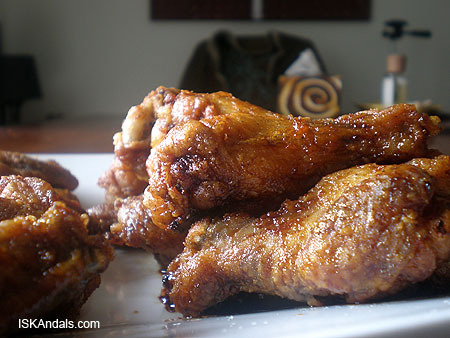 But whatever you do, always take note of the double-frying process that makes the wings extra crispy. Keep away from Chinese or pinoy soy sauce; too salty. Coat chicken evenly with salt and pepper and set aside. Heat oil in a saucepan. Saute garlic and ginger until fragrant. Add onions and saute until soft. Pour in shoyu and mirin, add brown sugar and bring to boil. Add chili and simmer for about 5 to 10 minutes. You may add salt depending on your preference. Set aside. Heat oil in a deep fryer over medium-high heat. Mix 1/2 part flour and 1/2 part cornstarch on a plate. 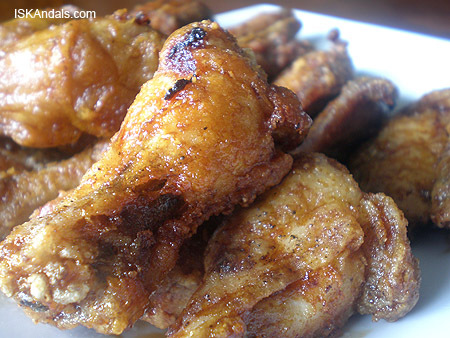 Coat chicken wings with flour mixture and deep-fry for about 10 minutes or until light brown. Drain and set aside. 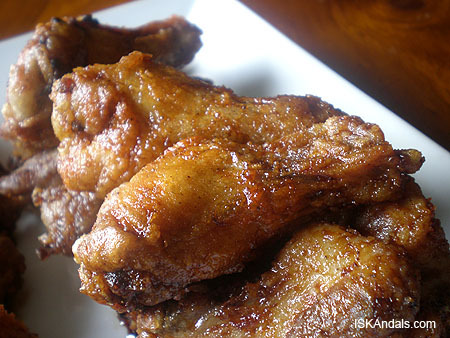 Heat the soy sauce mixture on another burner while you heat clean oil again in your deep fryer. 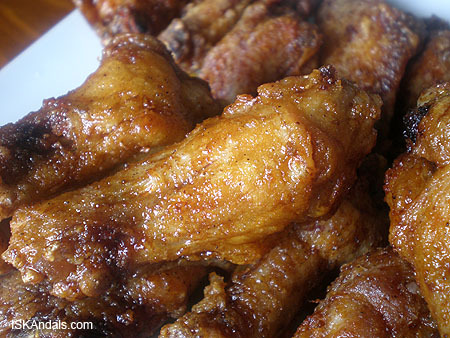 Working in batches of 3, preferably using chopsticks (easier at syempre para feel na feel), fry wings the second time around for about a minute or two (that would make them golden brown), then toss into the soy sauce mixture. Coat well on each side and transfer to a serving platter. This is my piece. With extra sauce . Tanghalian namin kahapon. Finger-licking good. The kiddo loves it. But he loves Tita Aerang’s original version better. Hahaha! Dagdag, luto gamit ang tirang soy sauce mixture after 3 days. With toasted sesame seeds. Heat oil in a saucepan. Saute garlic and ginger until fragrant. Pour in shoyu and mirin, add brown sugar and bring to boil. Add chili and simmer for about 5 to 10 minutes. You may add salt depending on your preference. Set aside. Heat oil in a deep fryer over medium-high heat. 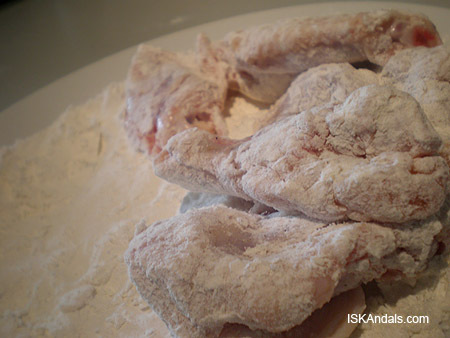 Mix ½ part flour and ½ part cornstarch on a plate. 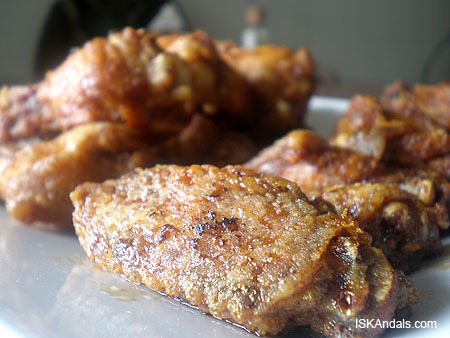 Coat chicken wings with flour mixture and deep-fry for about 10 minutes or until light brown. Drain and set aside. 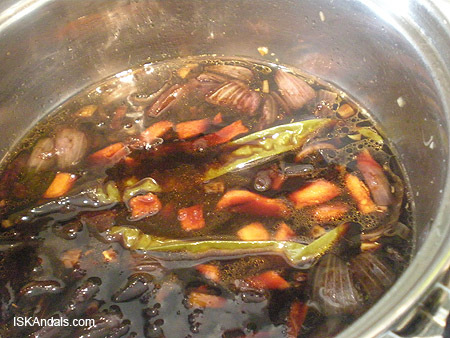 Heat the soy sauce mixture on another burner while you heat clean oil again in your deep fryer. Working in batches of 3, preferably using wooden chopsticks, fry wings the second time around for about a minute or two (that would make them golden brown), then toss into the soy sauce mixture. Coat well on each side and transfer to a serving platter. 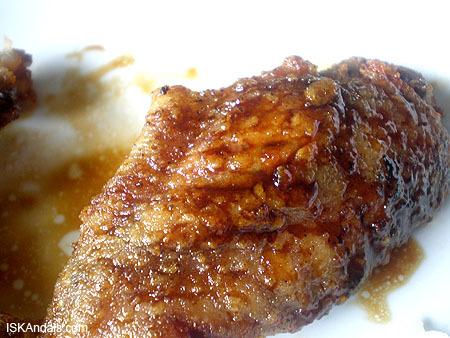 You may prepare the sauce hours or a day earlier and store in the fridge before cooking the chicken. You may also add toasted sesame seeds on the sauce for additional flavor. Cook time above is for approx. 1 kilo of chicken wings. Looks yummy! I have to try this recipe! Ginugutom tuloy ako! That looks yummm! Ginutom tuloy ako. Enjoy the rest of the weekend. Katakam-takam naman, Agree on double-frying process. This definitely gets my vote over KFC anytime – hahaha! Korean food is one of our favorites and I love their hot chili paste. The wings look really delicious. grabe! ang galing mong mag-tempt ng pagkain! nakakapag-laway naman yang mga kakodakan mo! ang lufet mong mang torture! hahahaaaa!! kung di lang gabi na, sasagsag ako at bibili nyang soy sauce na yan at yang chicken nibbles na yan! my gulay! Graveh na ‘toh, ang sarap! Zero carbs and yet delicious. 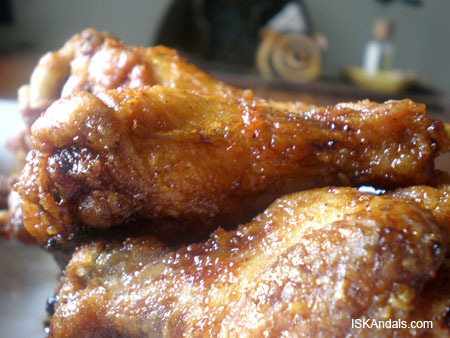 Have you also tried Vietnamese fried chicken? It is serve with a sprinkle of little fish sauce, lime juice and chilli before you eat them. K.noizki, I don’t think I have tried that but sounds yummy, too! Yes Ces, pang-coat lang sa huli. I tried coating it then frying. OK naman din. But it will darken a bit because of the sauce so I think that is why it is better the other way around. Palagay ko any korean soy sauce will do. Theirs always lighter and sweeter.